Near the Town of Nassaw, in Providence, one of the Bahama Islands, I saw two of there Trees growing, which were all I ever saw, the largest of them was about four Inches thick, and twelve or fourteen Feet in Height; the Bark was smooth, of a greenish russet Colour, and the Wood seemingly tough and hard: The Leaves were like those of Box, but smaller; they grow in Clusters round the Stalks, by Intervals of an Inch Space, more or less; from every Cluster shoots forth two sharp pliant Spines: The Flowers are tubulous, of a yellow Colour about six Inches long, hanging pendulous: They are monopetalous, being very small at the Calix, and wide at the Mouth, in Form of a Roman Trumpet, except that their Verge is divided into four deep Segments, which are usually reflected back. The Fruit is of an Oval Form, and of the Size of a Pullet's Egg; the Flesh or Pulp of it is like; that of a ripe Apple, covered with a smooth yellow Skin; the Middle of the Fruit is hollow, containing many small triangular Seeds, adhering to a Pithy Placenta, which runs through the Fruit: The Fruit has an agreeable Tartness, and good Flavour, and seems as if it was capable of being improved by Cultivation, but is little known. In the Year 1726 there was several young Plants of it raised by many to whom I distributed Seeds, that I brought from Providence; but none were so successful in raising it, as Mr. 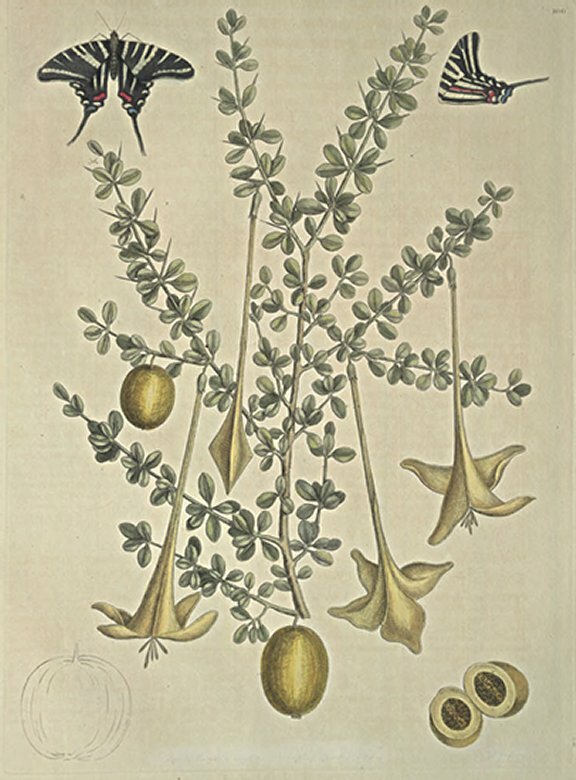 Powers, a skilful and curious Gardiner, at Mr. Blathwait's of Derham, near Bath, who raised a Plant which produced many fair and ample Blossoms, some Specimens of which he sent to my Friend Mr. Peter Collinson, in the Year 1734. The Back of this Butterfly is black, as is the Ground of the four Wings. Several white Lifts crosses the upper Wings obliquely; the two under Wings have likewise two white Lifts, extending downwards; they have besides four white Spots, with one red and a blue Spot in each Wing; the under Side of the Wing, besides several white Lines, has two red, and three blue Spots. N. B. It is not without Reluctancy, that I here exhibit a Plant with my own Name annexed to it; but the Regard and Obligations I owe to my learned Friend Dr. J. F. Gronovius of Leyden, who was pleased some Years truce to honour ate, tho' undeservedIy, with the Title of this Genus, obliges me not to supress it.